At Central Station, humans and machines continue to adapt, thrive... and even evolve. 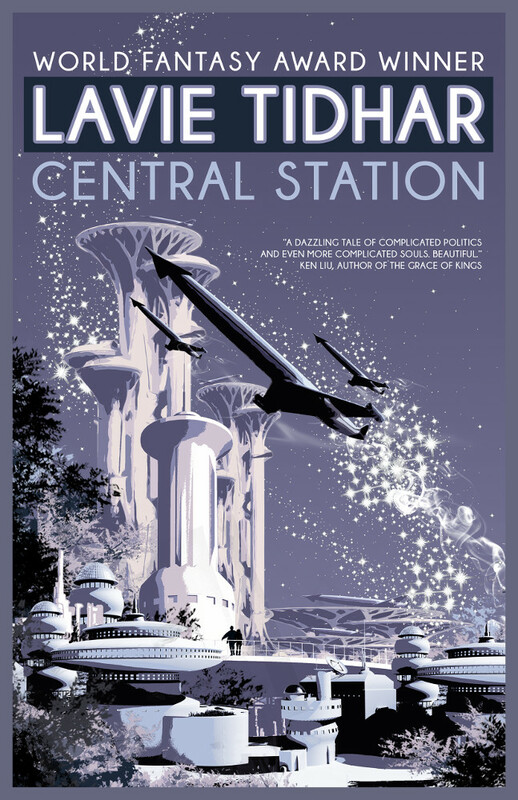 World Fantasy Award winner Lavie Tidhar rewrites the rules of the short story collection in Central Station, an ambitious assemblage of thirteen tales tall but indubitably true that are all the more remarkable when read together. "Substantially different versions" (p.251) of eleven of the efforts it collects were previously published, in various venues, between November 2011 and September 2014, and the handful of them that I read then impressed me immensely. 'The Smell of Orange Groves' and 'The Lord of Discarded Things,' for instance, represented intimate glimpses into the lives of a few of the disaffected folks who call the "bordertown" (p.34) at the base of the Central Station spaceport home. They were little things, those stories; lovely, and lively, and large of heart, but little, admittedly. Not so in Central Station, which generously extends the two tales I've touched on at the same time as seamlessly stitching together their characters and narratives with those of the other eleven featured here. Crucially, Carmel connects with Achimwene in a way he's always wanted, however her arrival also rather rocks the close-knit community Central Station is interested in—and of course it complicates Boris' renewed relationship with Miriam. Meanwhile, the infant Ibrahim adopts becomes the boy Ismail, and Ismail, alongside Miriam's own adopted son Kranki, has a revelatory role to play in the whole. And all that? That's just the start. Central Station isn't a particularly lengthy collection, but its brevity belies the ambition of a typical trilogy. It has an expansive cast of characters; more than enough, as a matter of fact, to justify the appendix Tidhar appends to the text—not that I ever felt the need to refer to said, as almost all of the people we see are given his or her or its own time to shine. Likewise, the overarching events Tidhar delicately threads through his third collection are absorbing in and of themselves, but at the same time, they open the door for the author to explore an embarrassment of ideas, including but not limited to the ascent of artificial intelligence, the aftermath of the technological singularity, robots as "an awkward evolutionary step between human and Other," (p.24) Earth's place in settled space, and finally—for this paragraph if not the narrative—the future of faith. Fulfilling that awesome promise—leaving Neve Sha'anan at last—is not nearly so easy for our unfortunate few; nor, indeed, was bidding goodbye to this exceptional collection an elementary experience for me. With each transmuted tale "a node linking the whole into something greater than its parts," (p.64) Central Station is without question the best assemblage of short stories I've read in recent memory. Sublimely sensual, emotionally moreish, and composed with crystalline clarity irrespective of its incredible complexity, if this is "what SF is going to look like in the next decade," as editor extraordinaire Gardner Dozois declares, then readers: the next ten years will be olsem diffren indeed—which is to say the same, but different, in asteroid pidgin.